When I first started this course I went upstairs to the third floor of my school for a bit of sketching practise and did a couple of drawings of the outside of the school building from the balcony. When this exercise came up it was a good excuse to get back up there as the school has a great view of the temple next door. 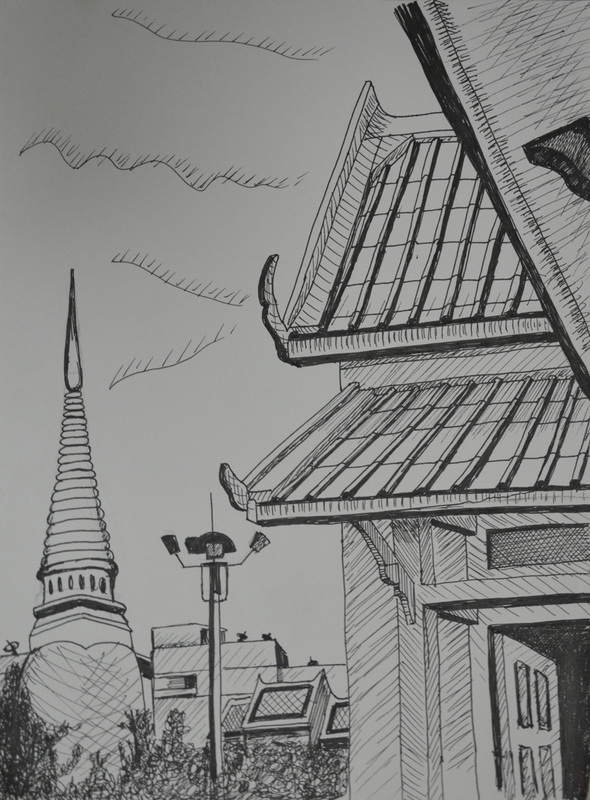 I actually completed this exercise well over a month ago but for the last couple of months I have been concentrating on drawing rather than my online log as Townscapes as been quite a long project for me with the irregular shapes of Thai architecture making this part of the course quite difficult but also very interesting. So anyway it was the start of the cool season and clouds were getting less and less in the sky and the only chance I got to go out on the balcony was 1:30 pm and the sun was beating almost straight down. The first preliminary drawing took me a little over 25 minutes with a Rotring Tikky Graphic 0.3 and even though it was quite messy I felt that that could have been the final drawing for this study. 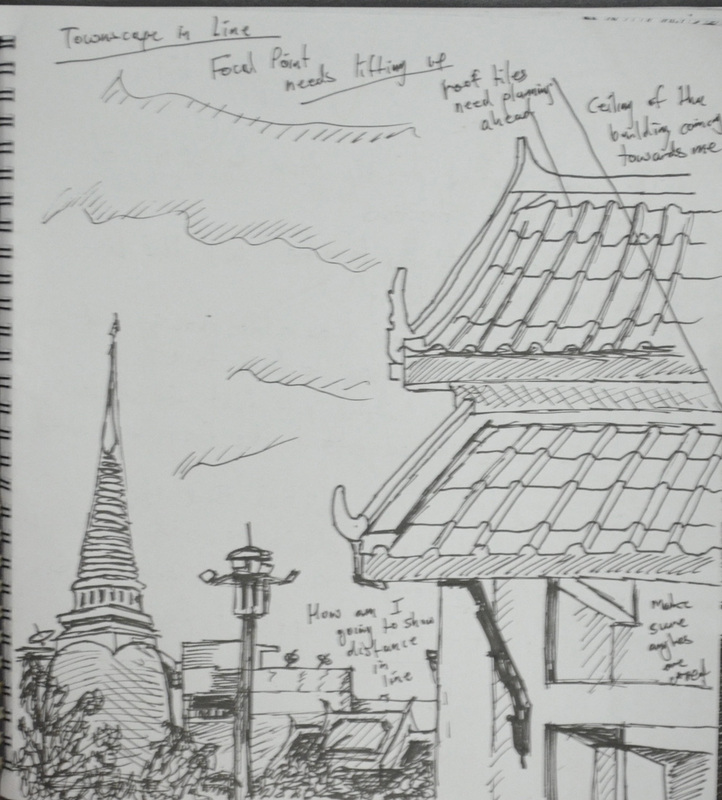 And reminded me of a couple of the pen drawings in the Urban Sketching Handbook, particularly Singapore by Kampong Glam by Paul Heaston and Nanjing Fuzimiao by Frank Ching, the latter drawn in 30 minutes roughly about the same time as my drawing. The second drawing took me from a flowing line drawing to something a bit more technical, with the first drawing everything flowed, I didn’t worry about the marks I was making and I wasn’t trying at all, with the second drawing I started to think about perspective the marks I was making the shapes I was drawing, negative space and everything went wrong. Instead of drawing objects I was familiar with I started to draw them like I was seeing them for the first time and everything went wrong. 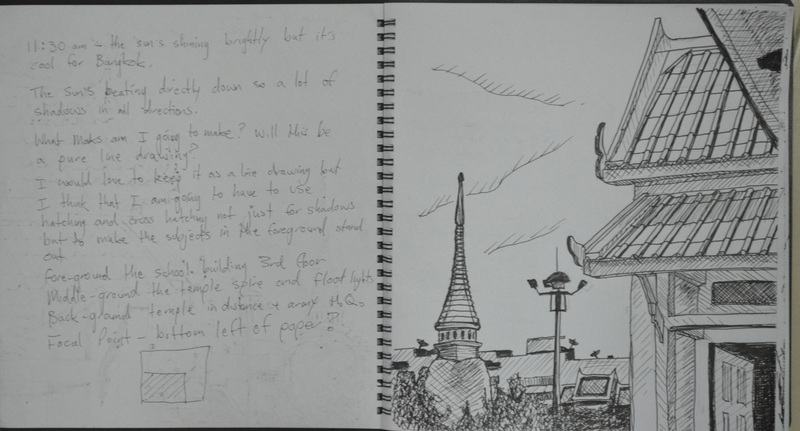 One of the biggest notable errors is the spire of the temple in the second drawing making it look like a Tibetan temple rather than a Thai temple. The final study was drawn from both of the preliminary drawings, using the temple from the first drawing and the school building from the second drawing every thing else was a mixture of both. I never had any doubts about what I would use for the fore, middle and background but what lines and marks to use was always going to stress me out. This is the second time I have had to do line drawings in an exercise and the second time I have found it hard not to hatch and even though I know a degree of hatching was needed I know I went over the top with it.